Third place winner in Society of Children's Book Writers and Illustrators 2015 Southern Breeze Writing Contest. Twelve-year-old Melanie is bored with her little sister and with yet another Mardi Gras in her hometown. But when she notices a secret code built into the floats of a Mardi Gras parade, she realizes that life might have some surprises left. Melanie and her friends set off to break the Mardi Gras code. They chase clues throughout the season's parades, sneak into forbidden float barns, and even join forces with the intriguing boy who lives down the street. A spirit from the past. A love for all time. Six months after her grandmother passed away, Beth feels like she’s moved on. But when she’s asked to spend the summer with her grandfather, she realizes her next job is to help him do the same. It seems an impossible task until Beth starts to receive some help, both in the form of a cute boy named Billy and a ghostly visitor that she can hardly believe. The Ghost with the Green Thumb is the second book in the True Girls series. If you like heart-warming stories of girls with humor and intelligence – plus a touch of romance – you’ll love Beth’s story in The Ghost with the Green Thumb. Try this fast, fun read today! When life gets tough, you’ve got to step up. Surrounded by good friends and able to indulge her passion for dance, Jenna’s life seems perfect. But when her dad loses his job, everything changes. Rather than quit dancing, Jenna scrambles to find a way to pay her own tuition. Unfortunately, she soon finds that starting her own business is more than she bargained for. Can she band together with her friends – and a new crush she didn't see coming – to pull it all off? 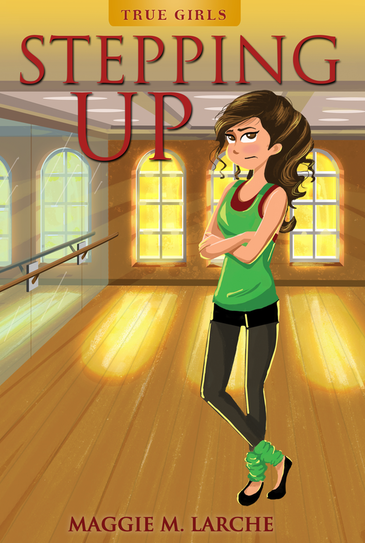 Stepping Up is the third book in the True Girls series. If you like heart-warming stories of clever and adventurous girls – with a touch of romance – you’ll love Jenna’s story in Stepping Up. Try this fast, fun read today!